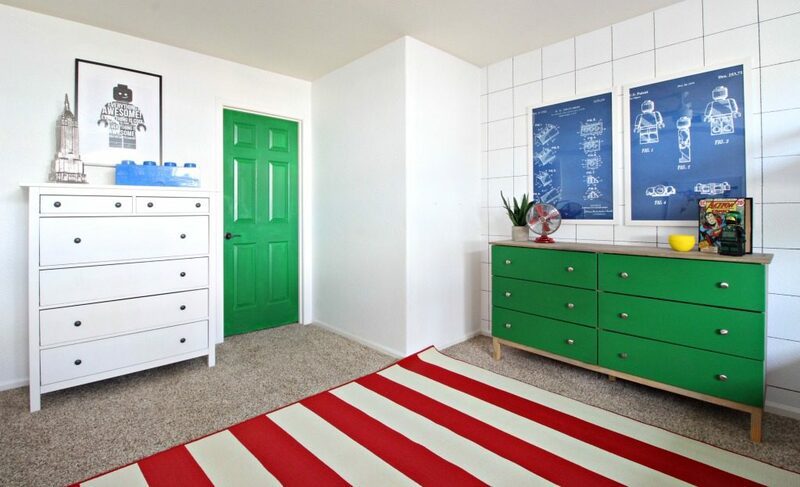 I’m always looking for awesome kids room ideas! 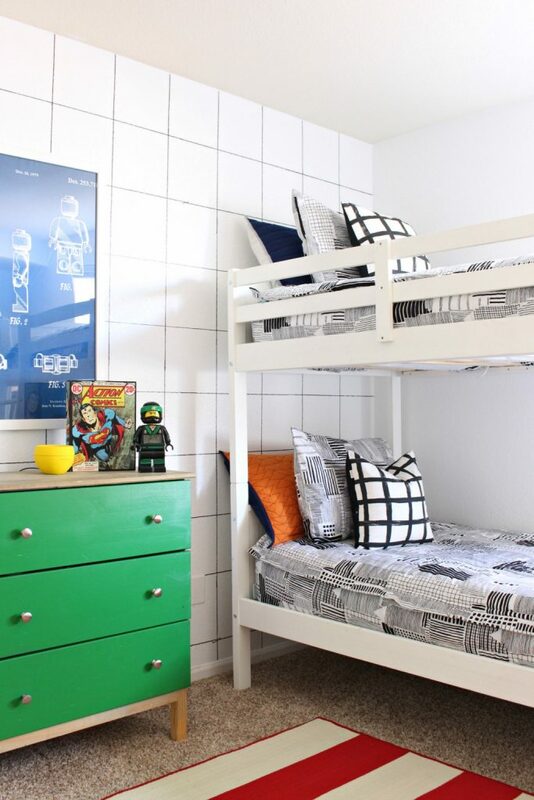 My boys requested a LEGO room for their room makeover so we gave them a colorful space packed with LEGO themed decor and accent pieces! 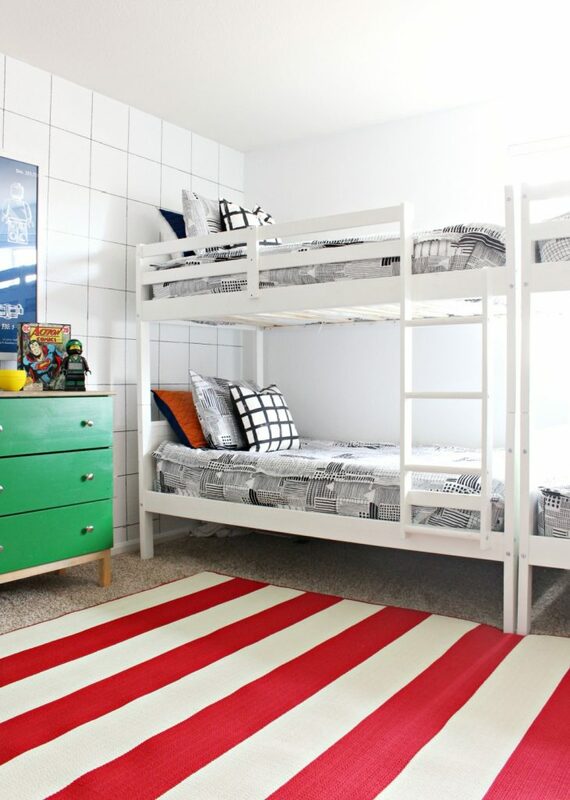 You guys ask for kids room ideas so often so I’m excited to share a new one with you all today! As many of you know, I have five little boys! They range from 2 months old to 9 years old and they are the light of my life! What mom doesn’t say that? 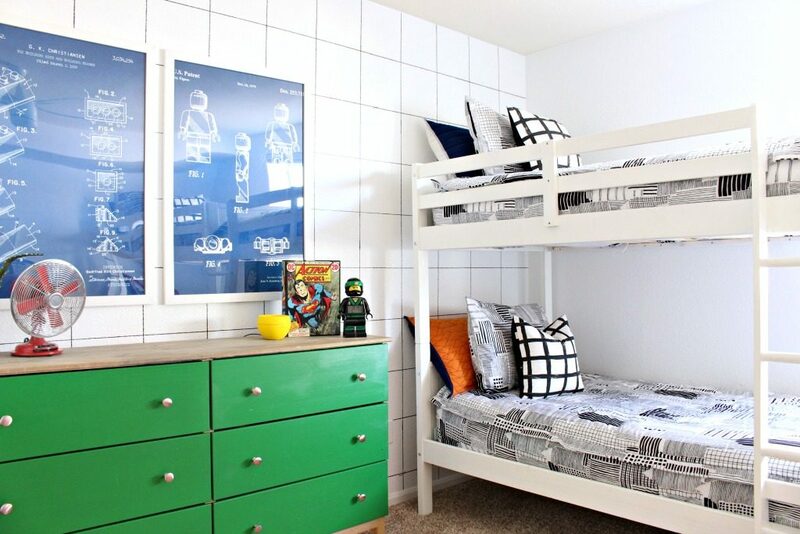 When we moved into our new house, the boys requested a LEGO themed room. Oh freak. That’s going to be quite the challenge I thought. 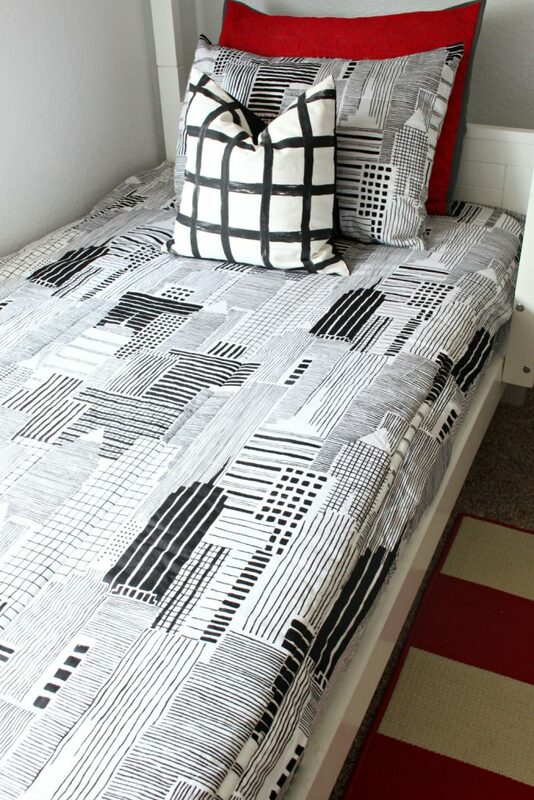 I knew I wanted it to be colorful, geometric (mostly square and rectangular shapes) and feel fresh and modern. Everyone asks how we manage to keep all of our kids in one room so I’m going to share my tips and tricks of what I’ve learned over the past few years. 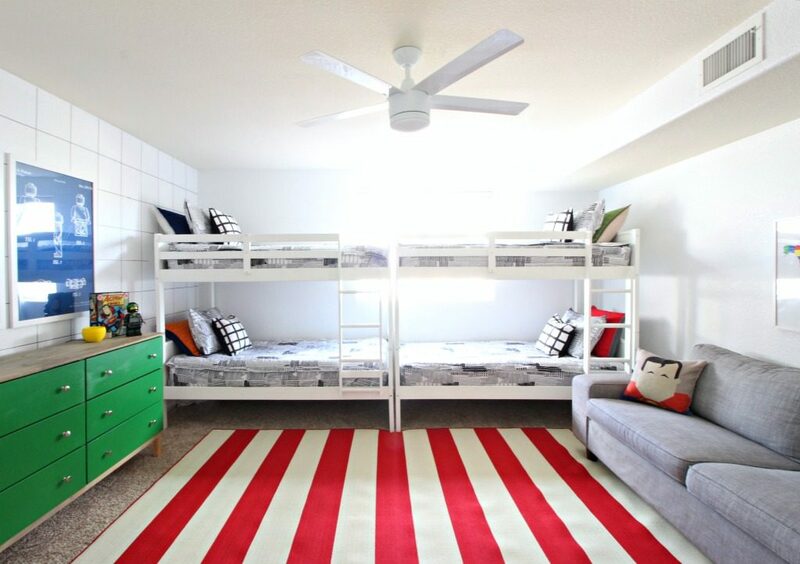 When designing a kids room, I first consider the necessities. So far, 4 of my kids sleep in here and as soon as my baby is old enough to move into his room with his brothers, he will sleep in here too. I’ll show you the plan for that. For now, I knew I needed 4 beds, space to play, and clothes storage. We store their toys in the playroom so I didn’t need to account for that. We decided to reuse their bunk beds that I got from Wayfair. I had a few must-haves for the bunk beds since they were going to be end to end along one wall. I knew I did not want a headboard/footboard that had a bunch of slats because I can just imagine my boys getting their arms and legs stuck through them which is certainly not idea. I also wanted a ladder that was vertical versus sloped to the floor so it wasn’t in the way when the boys want to play. It also makes it easier to clean the room and vacuum when the ladder doesn’t touch the ground. I probably overanalyze that type of thing but it really makes me life easier in the long run! 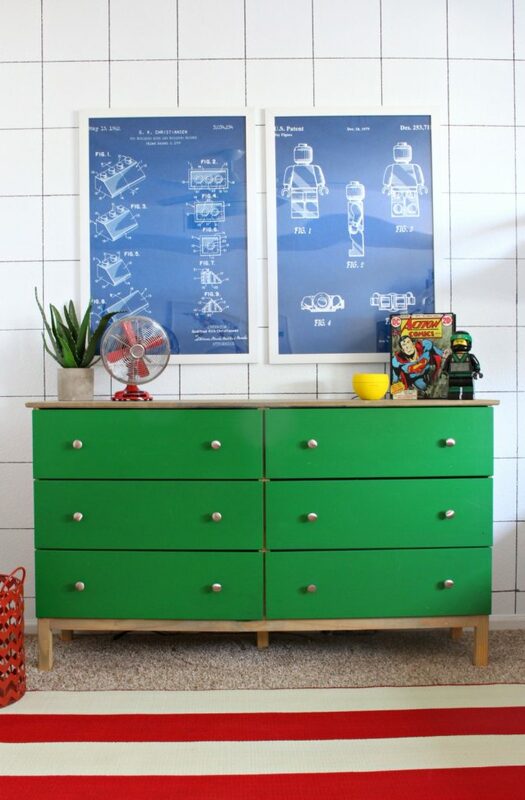 For the older boy’s dresser, I have the Ikea TARVA dresser that has gone through three different makeovers for different room designs. 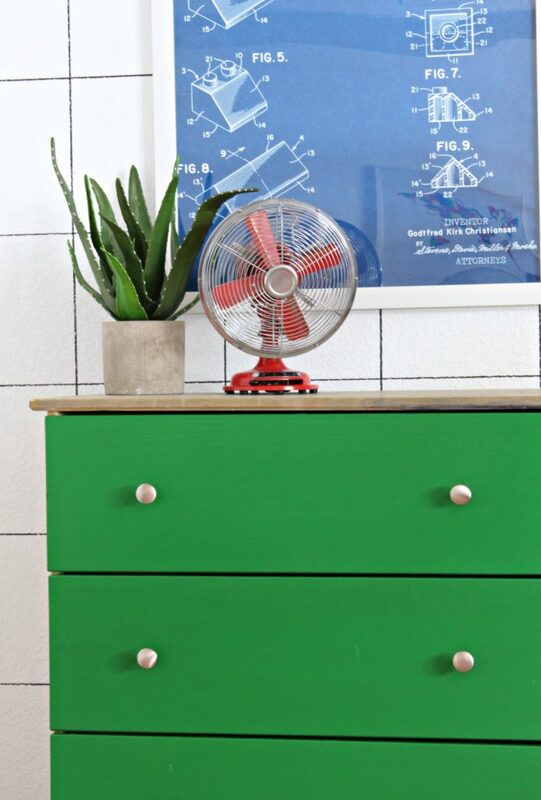 When you get it from Ikea, it comes raw wood and I stained the sides with Minwax Classic Gray and painted the front a bright green. In this dresser, each of my older 4 kids have a “pants” drawers and we have each kid’s drawer labeled with their names on the top ledge of the drawer. The bottom two drawers are socks and a “lost and found” drawer for when I find other kids’ clothes or toys at our house. Inside their closet we have a 3 drawer chest that holds pajamas, underwear and extra church clothes. All of their shirts are hung up. My baby has a dresser of his own since babies tend to have SO much stuff! Yep, it’s missing a knob. Oh well. All of their prints in their room are engineer and poster prints that I found on Etsy.I got all the poster frames at Michaels using a coupon. Check out my video on how to print poster and engineer prints. 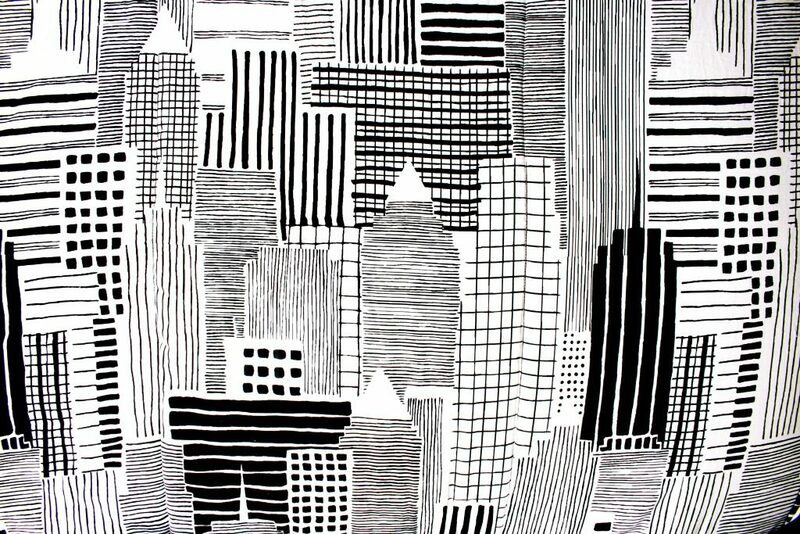 For the wall, I did a grid of 10″ squares using a black Sharpie paint pen. Make sure you use a paint pen, not a permanent marker if you want to try it! It’s super easy! 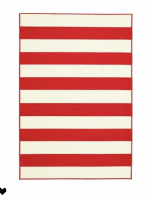 The rug is an indoor/outdoor rug from Wayfair. I love that since its durable enough for outdoor spaces, its durable enough for my boys! 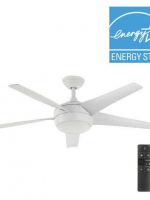 Their ceiling fan is from Home Depot. As soon as our sweet baby is big enough to be in a room with his brothers, we will remove the gray Ikea sofa and put his crib there. I have a SUPER cool Sharpie wall design I am going to do behind his crib but we’ll wait til he’s big enough to be in there before adding more projects to my list. That will probably be in a month or two. 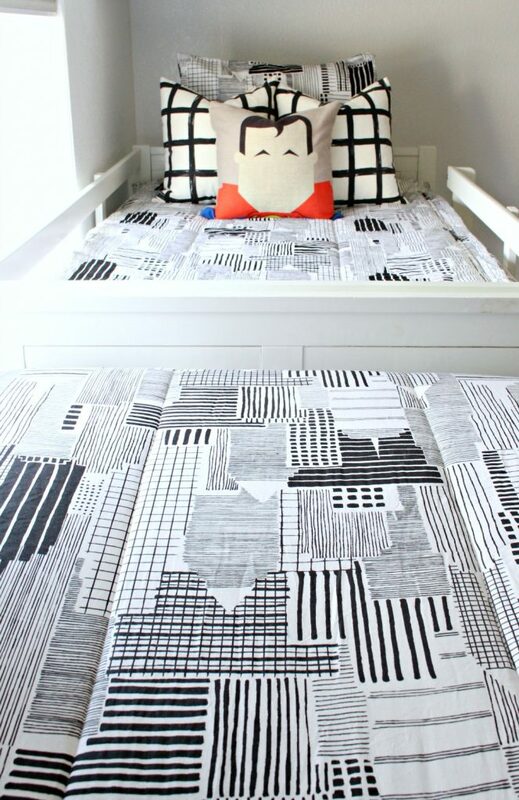 A MAJOR game changer for this space was their new black and white Beddys bedding! 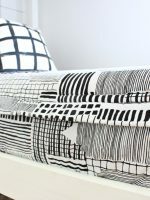 Beddy’s just launched their 2018 collection and the New York New York Beddys is a major SUPERSTAR this year! 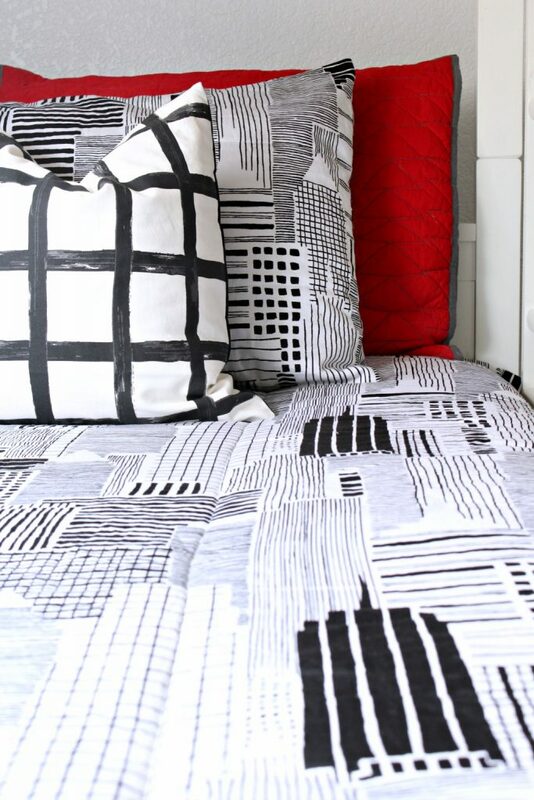 The New York New York Beddy is my all-time favorite Beddy and that’s saying something! PS. 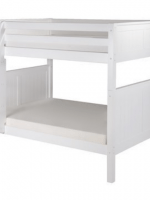 If you have bunk beds in your house, Beddys are crucial to your sanity. 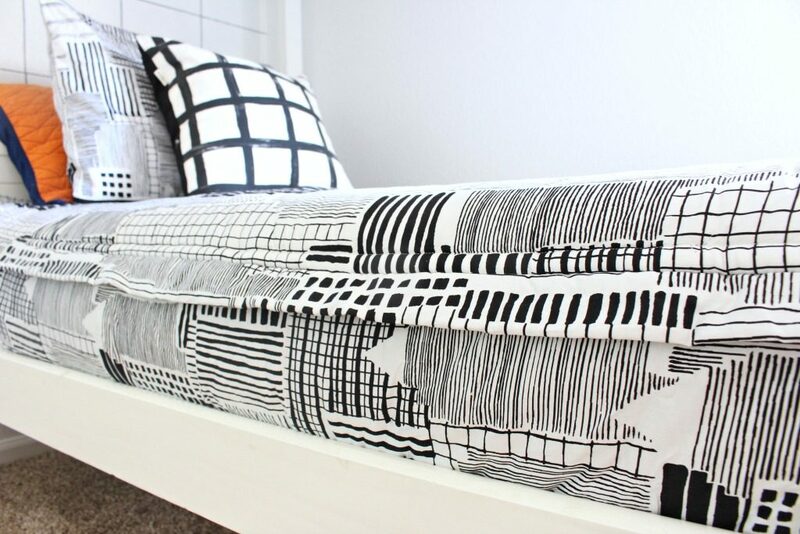 They are a huge lifesaver and I love that even when my kids make their own beds, they look amazing! Because Beddys just launched their new collection, TODAY, I was able to get you guys the BEST coupon code. Even better than the Beddys sale their having right now! 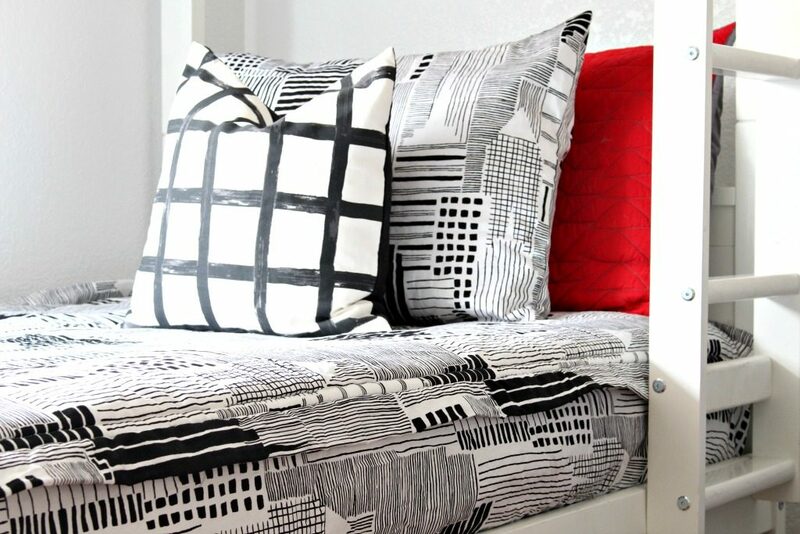 Using the code CLASSYCLUTTER25, you can get 25% off of their whole website, not just the New York New York Beddys! This is not a deal that comes around often… or ever really so do not wait to go grab yours! This is an exclusive coupon code for Classy Clutter readers! This is over $62 OFF of the twin size Beddys! I’m not sure how long this deal will last so hurry, hurry!!!! I seriously LOVE how their room turned out and I can’t wait to do a couple more things I have planned when baby Oliver gets to join his brothers. 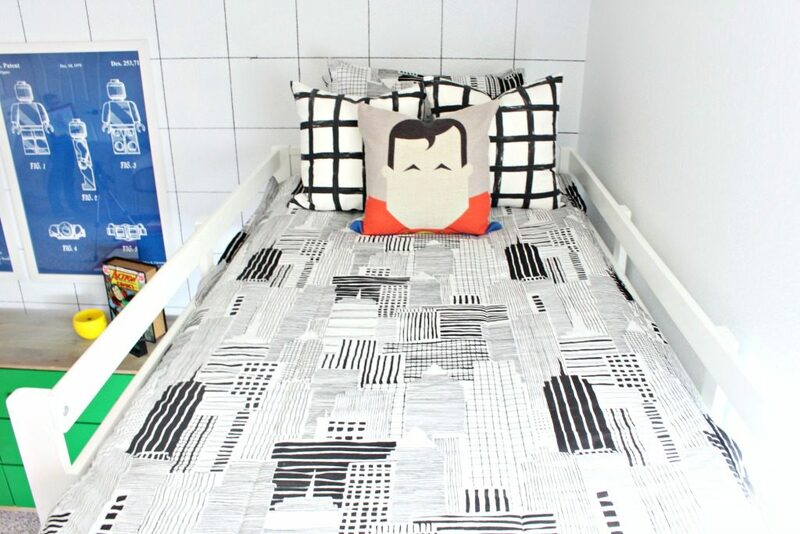 I also have a super cool LEGO bed idea that I’ll share soon!